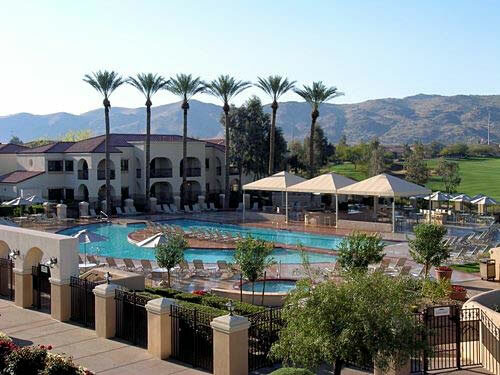 The Legacy Golf Resort is located in Phoenix, Arizona, just 10 minutes away from Sky Harbor Airport. This resort offers spacious accommodations, top notch amenities and a championship golf course, The Legacy Golf Club, designed by Gary Panks. The Legacy Golf Resort boasts 328 luxurious guest suites in 12 separate buildings. Choose a Studio suite, or a spacious one or two bedroom villa decorated in a Spanish theme featuring wood cabinets and southwestern style fabrics. Each suite at Legacy Golf Resort offers a full kitchen or kitchenette, spacious living area, and either a balcony or patio overlooking mountains and gardens. Enjoy exquisite dining at Trail’s End Bar and Grill serving breakfast, lunch and dinner each day. Pamper yourself at the spa where you could enjoy services such as the many types of massage, a multitude of body wraps or a variety of facials. Challenge yourself at the fitness center where many fitness choices await you. Everything you could ever need or want is located on site! However, if you would like to venture out and see the city, there are many places nearby. Arizona Mills shopping mall is within a 10 minute driving distance. Up to five golf courses are also within a 10 minute driving distance. While in town, enjoy Old Town Scottsdale, a local favorite just 15 minutes away from Legacy Golf Resort.